Description : The sycophancy of the other Slytherins to Draco Malfoy is truly sickening. This is absolutely perfect! I love your Pansy. She is just as I imagined her. I think Pansy's too pretty! But, the nose is perfect! My friend wanted to try out for the part of Pansy, one problem, she's not British. Although she can put on a pretty good British accent. Anyways, when she curls her hair she looks exactly like the pansy in your awesome drawing. 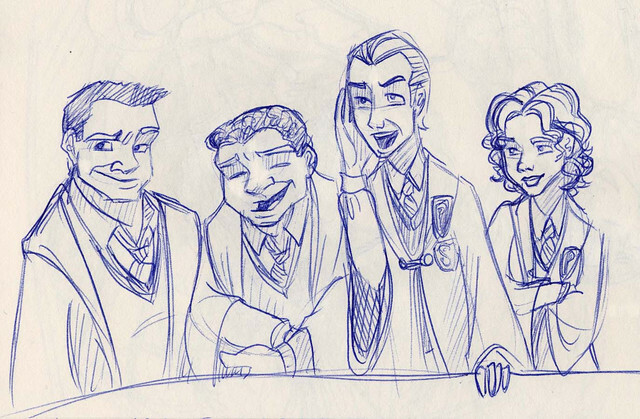 Crabbe and Goyle was the best here. I like Pansy too, and Malfoy of course !